If you’ve been a mom for any length of time, you know that occasionally you find yourself thinking, “Is this really happening?” You’ve convinced yourself that no one else’s family could possibly be as busy or messy as yours. No one else’s kids could come close to how whiny or picky or loud or accident prone as the ones you created. And no other mom on earth is as bone-weary as you. Until you actually speak to another mom. With the advent of Facebook and Pinterest, moms in my generation have shackled themselves to the belief that they must be all things to all people – or at least appear that way. Competition and judgement are commonplace, but it’s not doing anyone any good. What IS good, however, is when we can come to a place where we are comfortable enough (or crazy enough?) to share our messes and our successes in equal portions. By being honest and transparent with each other, we realize we’re not the only one whose kid hasn’t eaten anything but crackers in three days. We’re not the only one who threw out five pairs of soiled undies because we were just too exhausted to wash them properly. We’re not the only one who put mismatched shoes on our child because if we spent more time searching for the mate, they’d be late for school. Again. She may be tough, beautiful, and practically perfect in every way, but saving the world is only easy when you’re Wonder Woman. Being a mom, on the other hand? Now, that takes some serious superpowers. A lasso of truth, bulletproof wristbands, and an invisible airplane. Throw in a golden tiara, great hair, and abs made of steel and you’ve got a gal theoretically capable of saving the planet (and looking fabulous in the process, too, I might add). But moms aren’t looking to save the world. Nope. They’d settle for well-behaved kids, a clean home, an occasional nap or two, and maybe an uninterrupted trip to the bathroom every once in a while. They’d trade in the need for perfection–the desire for acceptance–and willingly cast aside those unrealistic expectations they’ve placed upon themselves in their roles as mothers. Jenny’s personal anecdotes will leave you in stitches and provide the opportunity to sigh with relief that you’re not the only one experiencing the kind of crazy you only see in the movies. Her tips on personal appearance, organization, meal planning, etc. are helpful and realistic (even if it means only choosing a couple that will work for your family… because after all, we shant compare ourselves to each other, riiiiiiiiiiiight?!). 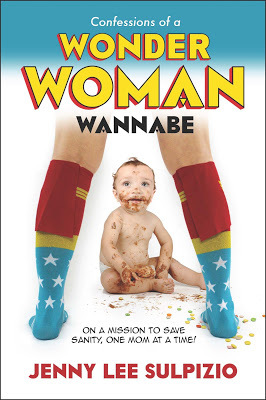 Her book is a great reminder to find that delicate balance between being Wonder Woman and being the wonderful woman and mother God created you to be. Disclosure: I was provided a free copy of this book in exchange for my honest opinions.